Welcoming the day. Welcoming sunshine and flowers. Even though August is full of warm warm days, it does bring with it the flowers and tomatoes so happily growing. Sam is learning more about growing things and that the greatest gift for these little veggies and zinnias and roses is rain and sun... more rain and more sun. And usually in August, we are always praying for more rain and more rain. Thankfully, we have already had some rain showers. It's actually very exciting when it starts to rain because we first hear it on our tin roof that covers the sunroom and the sound is like a little symphony playing.... it's a melody of sorts and some drums pattering away as well. Sometimes when Mike, Sam and I are all in the kitchen together and talking... we hear a thump, thump, thump and all say together, "It's raining!" Rain truly is a celebration during the summer months! One of my favorite things to do on rainy days is read. Reading to Sam, listening to rain showers on a lazy afternoon is the sweetest of sweets. One of my favorite books right now ( have to admit, I do have lots of favorites!) is this one my sweet sister in law gave me for Rosie. It has a gentle story of a little girl and her garden. The illustrations are beautiful and the book is filled with lots of color. I love it! 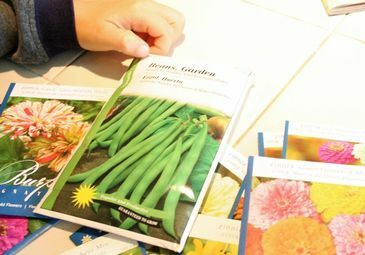 This time next year, Sam will have his sister to read with and read to ( he is practicing reading some of his books so he can read to her) and also plant zinnias with, pick tomatoes with. There will be all kinds of "withs" in the future! And we look forward to each one! There is a little tradition my friends and I have every summer. And it goes like this: We get the kids together, pack picnic lunches and head out of town to go blueberry picking! We make a journey down the road from Birmingham to the most enchanted garden and fairy tale farm called Petals from the Past. I think I have been going there for about 7 years now and each year it becomes more and more beautiful. 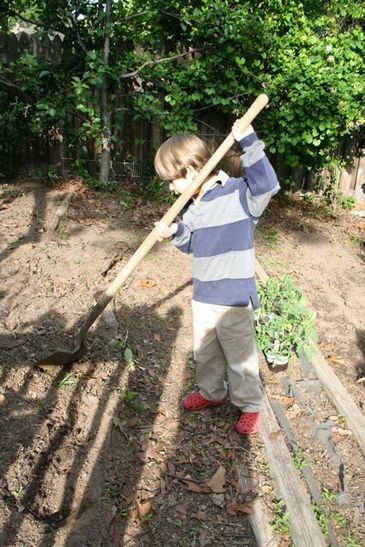 The berry bushes are bigger, there are more secret gardens and more fruit trees and fruit bushes and just more fun! I love love this place! It has gardens everywhere you look and whimsyness all around. There is a wrap around porch that goes around the entire farm house and inside the farmhouse is a treasure in itself. There are beautiful seed packets to buy and garden hats, tiny vases, all sorts of garden stuff and outside there are benches and tables that offer perfect picnic places. I adore this place! They have antique roses and every type of herb you can imagine. I just bought several chocolate mint plants... love the fragrance and they taste so good! If you look to the left of the red roses... we picnic in that little corner on the porch.... every year. I could take a million pictures of this place and still not get enough. 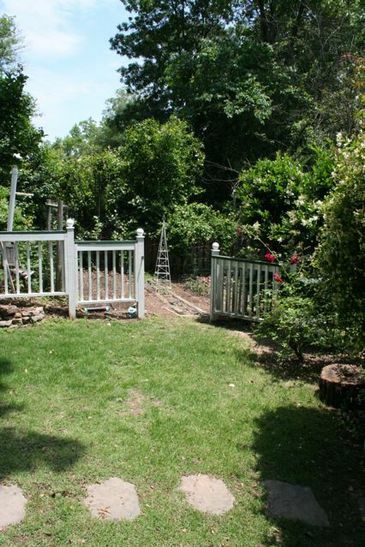 This is a part of the vegetable garden with a sitting area in the middle... perfect. And the blueberry picking begins. Kids love this! To have the luxury of bopping around from bush to bush and eat as many blueberries ( all organic) as you like... is a kid's wonderland day! (notice the shirts on the boys.. blue for blueberry day!) love it! Blueberries are one of Sam's favorite fruits... we just pick and eat and pick and eat eat eat! The berries were almost dripping off the bushes there were so many of them. These rows of blueberry bushes go on and on and on. Isn't this beautiful? Sweet blueberries.. and lots of them! Blueberry rest time among the bushes. Yep, a perfect little spot to take a break. A delightful day! So fun to be with friends and their children and enjoy a warm summer day in a sweet garden full of berries. Oh, I could just spend the entire day out there meandering through the different pathways and gardens, smelling all the herbs and looking at the colorful antique roses. ( oh, reminds me, I want to pick out a special rose bush for Rosie and plant it for her!) Would love a bush with big cabbage roses on it.. pink,fluffy and fragrant! So today was the day to pick blueberries and enjoy the sunshine and farm air. Tomorrow is the day to make the perfect blueberry pie. yummmm! Fresh garden time! My little garden is growing day by day, thanks to some nice rain and sunshine days. The zinnias are starting to bloom, the pole beans keep on climbing to new places, the pear tree has some small pears, and tomatoes are green, and I picked my first piece of produce for the season.. a green bell pepper! Why is watching a garden grow such a great thing? It allows me to slow down and cherish this beauty of a little bit of land that was given seed, water and dirt to make beautiful creations. This garden is small yet a big gift... it allows me to use all my senses ... touch, smell, taste, hear, see. I love the earthy fragrance of tomatoes, the colorful pinwheels of zinnias, the happy freshness of mint, and sweet songs of birds fluttering around. The birdies especially love fluttering through the sprinkler and taking little baths in the garden too! Sam wants us to move our table over to the garden and have a little garden dinner and say garden prayers too. ( he is already a romantic!) Think we may just have to do that during the magic hour.. twilight! This past weekend was garden time. 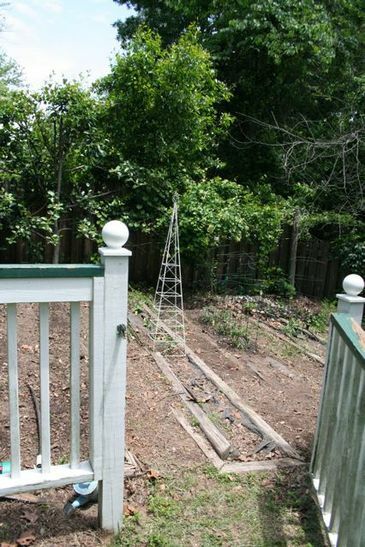 We picked out what we wanted in our garden and then got to work. Zinnias, pole beans, tomatoes, red and green bell peppers and squash was on our garden menu. Oh, can't wait to eat a nice big juicy garden tomato! 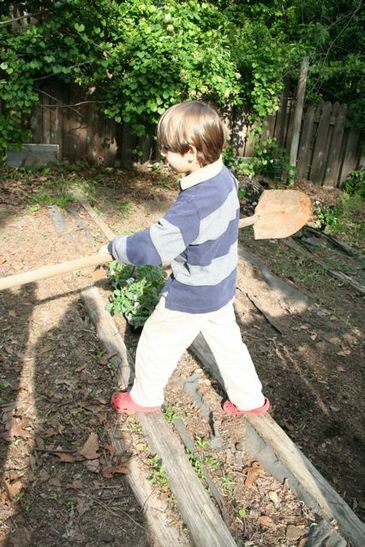 Here is little farmer boy going to work in the fields. But this field is only a few feet long. 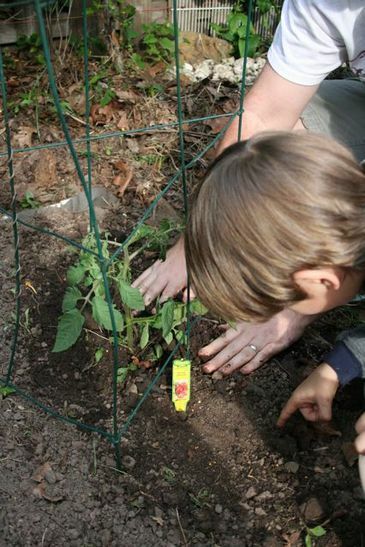 Planting the tomatoes with farmer dad and farmer boy and noticing the tiny things of life. Yipee! Planting is finished, now we need some rain drops to make the garden grow. Love May... love spring... love this little patch of the yard. Oh, yes, we love you too Mo Mo. 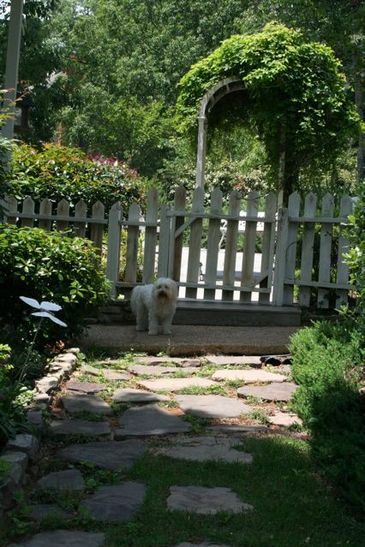 What would a yard be like without our little fluff dog! Happy start to everyone's week!